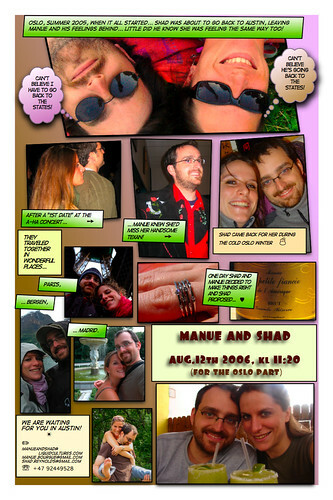 Our wedding announcement, originally uploaded by manueb. This is to announce that on August 12, 2006 at 11:20am, Manue and I will be married here in Oslo, Norway. Manue and I met here in Norway and started dating at the end of last summer (just 10 short days before I was supposed to move back to Austin). After returning to the US, we talked every day and it became obvious that I needed to get back to Oslo ASAP :) I ended up staying for much of December, January, February & March here. Then, in late March, we headed back to Austin for a couple of weeks. That’s where I proposed. Unfortunately, she was only over for a short time and had to leave in early April. I flew back to Oslo May 17 and we’ve been together here ever since. While we’re very happy to finally be able to start our life together in the US, we’re also sad that we can’t share this day with all of you here in Norway. Unfortunately, the cost of getting to Norway on such short notice is quite expensive. While we would love to have you all here, we understand that it’s most likely not possible. But don’t despair!! We’ve decided to also have a ceremony in Austin and a party in Franklin County once we’re back and settled a bit (most likely next spring). We’ll also be travelling around a bit in the states once we get back to see family and friends. Hopefully we’ll get to see many of you before next spring. Anyway, guess that’s all for now. Please check out our Flickr accounts if you want to see more of what we’ve been up to. This was written by shad. Posted on Monday, July 24, 2006, at 11:37 am. Filed under Meta, Photo. Bookmark the permalink. Follow comments here with the RSS feed. Post a comment or leave a trackback.